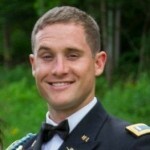 Conor graduated from The United States Military Academy at West Point in 2009 with a BS in Environmental Engineering, and Majored in Mandarin Chinese. He then entered the U.S. Army where he served as an Officer in the Infantry for five years, deployed for one year to Afghanistan, and attended Ranger School. Conor left the military in 2014, and moved to California with his family to attend law school at the University of California, Berkeley School of Law. Conor served two externships with the U.S. Attorney&#039;s Office for the Northern District of California, and is currently an associate with the firm of Nixon Peabody, LLP.